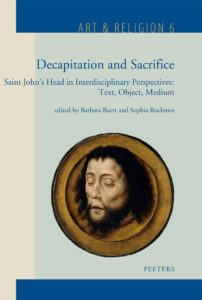 The anthology Decapitation and Sacrifice is the result of an interdisciplinary project on the phenomenon of the decapitated head of Saint John the Baptist in its exegetical context, in the material culture of the Middle Ages and the Renaissance, and finally in more recent approaches regarding medium studies. Several specialists and scholars from these fields were invited to share their most recent conclusions, thus contributing to our understanding of one of the most peculiar events, artifacts and phenomena in West: the rise and fall of a male head as subject of martyrdom, devotion and artistic expression. Editors: Rochmes S. , Baert B.